Cupcakes are a delectably indulgent treat - and so quick and easy to make! 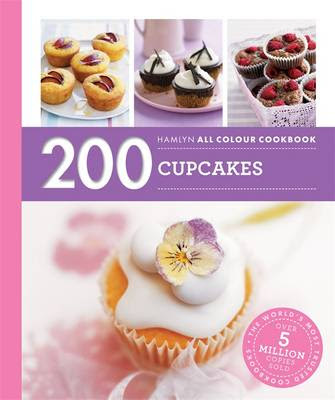 From colourful cakes to keep the kids entertained to sophisticated recipes for special occasions - Hamlyn All Colour Cookbook: 200 Cupcakes has something for everyone. Why not treat yourself to some gorgeous mocha cupcakes or delight a friend on their birthday with some maple, pecan and white chocolate muffins? Each recipe is accompanied by easy-to-follow instructions and a full page colour photograph to ensure perfect results every time. This is a fab cupcake recipe book that is great value for money when you consider how many recipes it contains. The book starts with an introduction that contains information about the kind of tools you'll need and some basic baking tips which I'm sure most amature bakers will find useful to read through before getting started. 1. Everyday cupcakes - This section contains basic recipes for everything from vanilla to various kinds of fruit and nut, citrus flavours, coffee cupcakes, carrot cupcakes, gingerbread and even marshmallow. There are cupcakes here to suit every taste bud and although I've only tried one of the recipes so far (the Very Cherry cupcakes which tasted delicious even though I had a bit of an icing disaster!) I can't wait to test the rest. I particularly love the sound of the Poppy Seed and Lemon, Iced Gingerbread and Warm Pecan Caramel cupcakes! 2. Chocolate cupcakes - This section is a chocoholic's dream: Chocolate Fudge, Chocolate Cheesecake, Chocolate Orange, Minted White Chocolate, Chocolate Strawberry, Chocolate Brownies and Mocha are just a few of the different flavours you'll find in there. Again I can't wait to get baking! 3. Cupcakes for kids - A lot of the cupcakes in this section use the vanilla cupcake recipe for the actual cake and focus more on different creative ways to ice them using both buttercream and icing along with different fruits or sweets. These are the kind of ideas that you can use to have fun decorating with fairly young children and still come up with pretty looking cakes that the whole family will enjoy eating. 4. Cupcakes for adults - Slightly more sophisticated than the previous section but if you like the sound of Almond Praline, Strawberry Marguerita, Pistachio, Red Velvet, Coffee and Walnut or Lemon Meringue then you'll have plenty to choose from here. 5. Savoury cupcakes - This is the most interesting section and one I'm looking forward to trying out. When I think of cupcakes I automatically think of something sweet with lashings of buttercream icing but this opens up a whole new savoury world. With recipes like Corn Chill and Bacon, Goats' Cheese and Tomato, Smoked Salmon or Spicy Cheese and Parsnip I'm having trouble deciding where to start! 6. Special occasion cupcakes - Christmas, Easter, Halloween, 4th of July, Weddings, Birthdays you'll find something for pretty much any occasion in this section. Each recipe in the book comes with clear and easy to follow instructions, a large colour picture of the finished cake and plenty of tips to help you achieve great results. I can't wait to try out more of the recipes and I'll update this review as I do.